All transactions are safe and secure with a reliable history in online purchasing behind each of our associates. 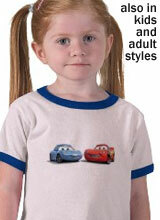 Buy the Cars Sally Carrera t-shirt to own Cars clothing and merchandise. Voiced by Bonnie Hunt, Sally is a royal blue Porsche 911 Carrera. She is Lightning McQueen's love interest and eventual girlfriend in the movie. Lightning and Sally meet when he inadvertently destroys the main road of the town. As the local attorney of Radiator Springs, she convinces the judge, Doc Hudson, to lessen the punishment to community service by way of paving the damaged road. This Cars Lightning and Sally t-shirt displays the adorable couple who are also featured in the sequel. They now operate the Wheel Well Hotel. In addition to the Cars Sally Carrera tee above, browse the Cars Clothing Gallery for more apparel like men's and women's clothes, kids shirts or hoodies.